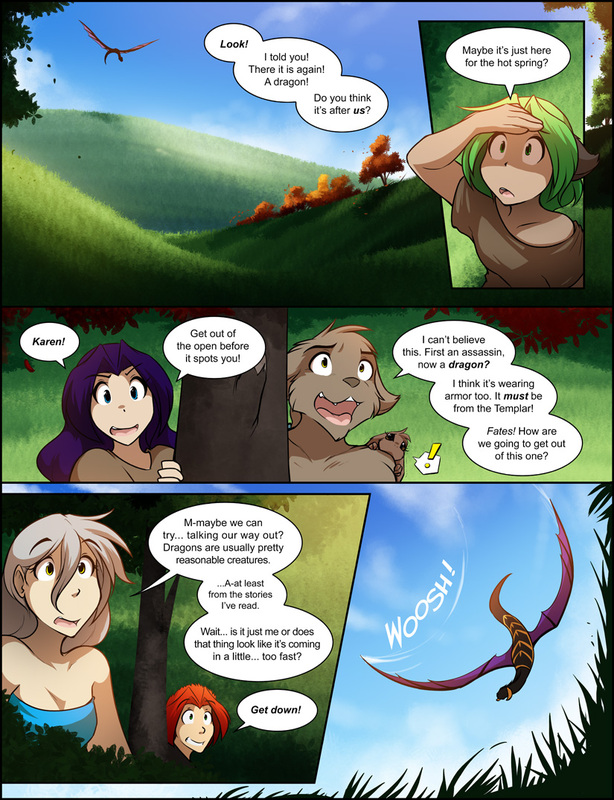 1003: Dragon Spotted - Twokinds - 15 Years on the Net! Karen: Look! I told you! There it is again! A dragon! Do you think it’s after us? Karen: Maybe it’s just here for the hot spring? Maren: Get out of the open before it spots you! Sythe: I can’t believe this. First an assassin, now a dragon? I think it’s wearing armor too. It must be from the Templar! Fates! How are we going to get out of this one? Raine: M-maybe we can try… talking our way out? Dragons are usually pretty reasonable creatures. …A-at least from the stories I’ve read. Wait… is it just me or does that thing look like it’s coming in a little… too fast?